I don’t think I’ve seen this tip mentioned before in blogs or documentation and yet have had the request from different users and customers. If you want to log all the asadmin commands, simply set the AS_LOGFILE environment variable to the name of a file. If you think this should be the default behavior, file an issue (with “3.2” as the “Fix Version”). I’ll vote for it! If you’re trying to troubleshoot asadmin (or simply curious) you can set export AS_DEBUG=true to obtain a chatty output. With GlassFish being a very capable HTTP server out of the bowser (thank you Grizzly! ), it was time for v3 to offer the ability to configure directory listings. It is now possible to have pages listing files per NAME (default), SIZE, or LAST_MODIFIED. Configuration can be done inside web.xml (in the form of an additional init-param to the DefaultServlet servlet called sortedBy). This would hold true for a given application and support dynamic reloading (no full redeploy, no restart to take changes into account). Of course there’s also the XSLT approach to have yet more control over the presentation. Check the use of localXsltFile and globalXsltFile in the default-web.xml file itself. A few months back Sahoo mentioned the use of "asadmin deploy --libraries" in the comments section as an effective way to deal with libraries. I recently had two people ask me about the behavior of GlassFish when multiple applications are deployed with --libraries pointing to the set jar file so I thought I’d share here what I found (this is for GlassFish v2.x). Thanks to Siva and Hong for the help there. When multiple applications have --libraries pointing to the same jar, the classloading infrastructure tries to “share” the jar by loading it in the same classloader. A side effect of this is that modifications to the jar require the undeployment and deployment of the application (along with its --libraries option) for it to use the updated version of the library. A simple deployment will trigger a ClassNotFoundException. Note that it is your responsibility to keep track of all the applications using a given library and to do an undeploy/deploy for all of them as you may otherwise end up having different applications using different versions of the library. 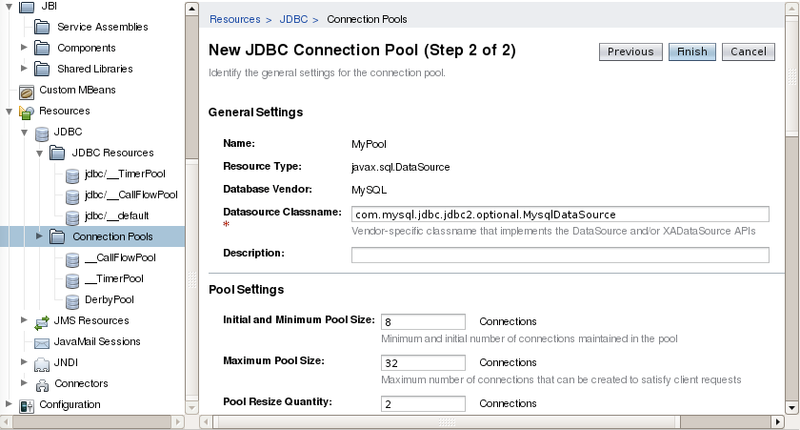 It may well be old news to some, but the JavaHowTo blog has some nice tips on using GlassFish. I’m moving from the (NetBeans) GlassFish development server to a production server and my application won’t run! Help! I’ve recently seen a flurry of people moving to production GlassFish servers coming from a NetBeans development environment so I thought I’d write down in this post what I’ve been replying on the various mailing lists and forums. 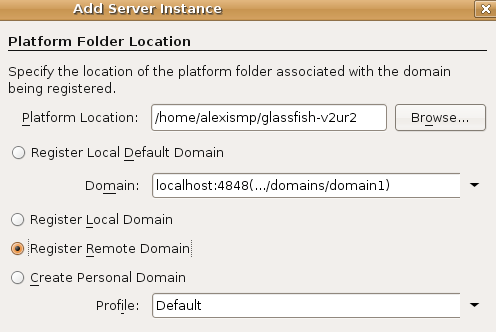 1/ add the remote production GlassFish server to the list of NetBeans servers. The trick is that you first need to point NetBeans to a local install and later describe the remote server with IP and Port number. 2/ use the GLASSFISH_HOME/bin/asupgrade tool to inject all the applications/resources/configuration from a source to the production target. Note this tool can work across multiple version of GlassFish and migrates things like security stores, virtual servers, etc… If using strictly the same bits (same version of GlassFish) in development and production, you could also probably use GLASSFISH_HOME/bin/asadmin backup-domain and the GLASSFISH_HOME/bin/asadmin restore-domain commands. 3/ re-create all the resources using either the CLI (asadmin) or the GUI (http://localhost:4848). For Make sure you can ping the database when creating connection pools. All of this (deployed applications, JNDI resources, virtual hosts, and configuration) is stored in GLASSFISH_HOME/domains/domain1/conf/domain.xml. You shouldn’t edit this by hand but it may be useful for troubleshooting and diff’ing the development and production environments..
Update : Peter Williams suggests a fourth way using sun-resources.xml . Author alexismpPosted on August 22, 2008 March 19, 2012 Categories GlassFishTags tips5 Comments on I’m moving from the (NetBeans) GlassFish development server to a production server and my application won’t run! Help! The default timeout value for the Web Admin Console of GlassFish v2 is set to 60 minutes by default. …or modify the value of <das-config admin-session-timeout-in-minutes="60" ... in the domain.xml config file (editing XML by hand isn’t a really good idea). Make sure you restart your browser for this to take effect (thanks Kedar). The documentation for this feature is here. Previous GlassFish tips are here. domain.xml (located in GLASSFISH_INSTALL/domain/DOMAIN_NAME/config) is a key configuration file in GlassFish and it should never be edited by hand. So now that I’ve said this, I’d be lying if I said I never did this myself. And yes I’ve had times when my config file was corrupted which would prevent GlassFish from starting. If you end up with a corrupted domain.xml file *without* editing it by hand (never happened to me), you have one thing to do: file a bug with steps to reproduce. You can also try to fix the content of this config file with a smart XML editor providing code completion, color syntaxing and well-formeness verification based on its DTD. If you’re using NetBeans, go to “DTDs and XML Schema Catalogs”. If you’re using GlassFish 3 and above, you probably want to read why there is no longer a DTD/Schema.